So this thought has been bouncing around in my cranium awhile, like many other story ideas of which many become explicably trapped in thee all conquering NoFenders Wormhole Vortex - not to be ‘Cornfuzed with the Angstadt Unit of Time; Hya! 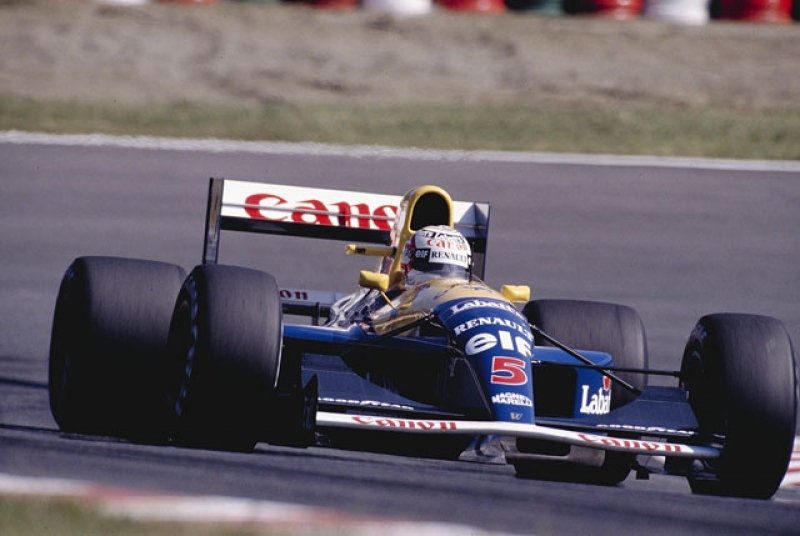 Thus I now find myself scrambling to poond out this story “Justin-time” to commemorate Il Lione, nee BLOODY ‘NIGE, aka Nigel Mansell’s Formula 1 World Championship winning season two decades ago aboard the mighty FW14B Williams-Renault. And I’ll have to admit I enjoyed spending many years making fun of ‘Ol Bloody Nige - especially with my favourite memory being him bumping the kill-switch whilst waving to his adoring British subjects (fans) on the final lap of the 1991 British Grand Prix - as the car suddenly grounded to a halt and his bitter arch nemesis Nelson Piquet most surprisingly took the chequered flag for Benetton instead! Which of course Mansell dutifully stuck a cork up Warr’s backside by winning his debutant Grand Prix the following season at the European GP; upon having moved to Team Willy, nee Williams Grand Prix upon having been dumped by Lotus in favour of some Brazilian named Ayrton Senna! Although Senna struck first blood by winning his debutant Grand Prix victory in the Portuguese GP - only his second outing for Lotus, our man Nige was busy nipping at his heals by finishing runner-up. Then Senna later claimed a second victory at Spa. Yet, just to pour salt in the wounds of Warr, Mansell triumphed with victory no less than upon home soil at Brands Hatch for his maiden F1 win later that season, before going back-to-back in Grand Prix victories after winning the South African Grand Prix, hence leaving the two future world champions knotted 2-2 in the win Colum for the ’85 season. And while Nigel won an even more impressive Hungarian Grand Prix later that season with his breathtaking pass of Senna en route to victory; 1990 teammate Alain Prost’s superiority saw the Brit contemplating retirement. Yet with the immediate hiring of fired March technical director Adrian Newey to Team Willy by Patrick Head, Nige was coaxed into returning to the English team for what would ultimately become his shining moment in Formula 1, albeit he’d need to have a close battle with Senna in 1991 before reaching his zenith in F1. Newey’s Williams FW 14 turned out to be the second most successful chassis on the grid that year, when McLaren’s MP4/6 Honda V-12 driven by Senna and teammate Gerhard Berger outscored Team Willy in the wins Colum 8-7; with Ayrton claiming seven victories to Gerhard’s lone win, while Nige won five races with teammate Riccardo Patrese garnering two. 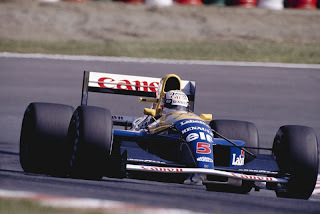 As the only other team to claim victory was Benetton with the aforementioned foophah by Mansell at Silverstone that year. Thus as we all know, Nige and Sir Frank (Williams) had a falling out most likely over money, albeit apparently Mansell had numerous “Number-1” status issues, not to mention his good buddy Prost’s return which ultimately led to Manselll’s decision to retire from Formula 1 and cross the Atlantic in order to take up residence as Mario Andretti’s teammate at Newman Haas Racing for the 1993 Championship Auto Racing Teams series season, replacing Mario’s son Mikey who’d ironically jumped ship to Formula 1. And I’ll have to admit I vaguely recall Jim McGee claiming he needed to take responsibility for Mansell getting jumped by ‘EMMO and thee Flying Dutchman (Emerson Fittipaldi & Arie Luyendyk) whilst leading his debutant Indy 500 before ultimately finishing third... Yet I seem to recall reveling more in the fact that Dennis “Vitale” Vitolo landed on top of an unsuspecting Nige the following year in ’94 instead. Yet, Mansell’s sophomore season in CART was a relative disappointment, with Nige’s abrasive personality being so strong that perhaps it tipped Mario into retiring? Not to mention apparently falling out of favour with fans in droves, reputedly even leaving to the canceling of one Kmart promotion, before Mansell took the money and ran back across-the-pond to Jolly ‘Ol England and the rarified climes ‘O Formula 1, namely the stately confines of Team Willy to help fill the Ginormous vacuum left by Ayrton Senna’s death that May at Imola.